When I think summer, I think new washer and dryer. Well, no, but Home Depot does. They are offering some amazing discounts on top appliances. 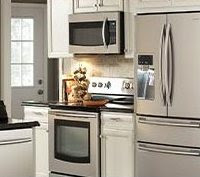 So save on refrigerators, washers, dryers, range stoves, dishwashers, even microwaves. They offer FREE delivery and haling away of your old appliance, and offer 12-month in-interest financing too. There's nothing worse than when your refrigerator dies. Mine did a year ago and it was a slow death. I finally (literally) pulled the plug on the old girl and sat with her a while. Then I scrambled to find the best deal within the five hours I had until my food defrosted. Where were you then, Home Depot? Oh, wait, that's where I got the new one. Never mind. Click here to view the deals at Home Depot.